European style back brush reaches 2 feet. Long handled back brush has contoured design that molds to your individual shape for deep massaging and invigorating cleansing. Extra long, gentle bristles are rejuvenating. Back scrubber is made of wire and polypropylene. Skin feels silky soft...just like stepping out of a Swedish salon! Taking the brush out of the package, thought the bristles too stiff and scratchy, but they weren't at all. In the shower the bristles were just right. You can bend the brush into a curve, makes it easier to reach. I would BUY AGAIN. works good. wish the handle was a little longer and was made of something a little softer. something that would hold a little more soap on it. Just what I've been looking for! Since I broke a shoulder some years ago, I've had difficulty reaching to wash my back. I was worried that the bristles would be too scratchy...but no worries! They are very soft and feel great on my back. Thanks! The brush is a wonderful way to exfoliate when taking a shower, i can brush my entire back, I love it. love this brush! have been looking for it, for years soft brush yet effective.. bought one for my son has great reach! It is easy to use from top or bottom. It's nice to be able to get a clean back. Daily showers are a treat with this "feel good" brush! Easily gets to those hard to reach places on my back. Kind of hard to hang when not in use but worth the effort. Well pleased with this soft bristle, back brush. The extended length and width makes this the most useful back brush I have used and far lighter in weight than previous brushes. Though not as attractive as others, you won't be disappointed. A Back Brush that Really Works! A back brush that reaches where ever you want. Custom bend to fit an excellent product that does what it's claimed to do. Not a back brush with a handle that reaches your shoulders a back brush that reaches your whole back. The extra length reaches the hard-to-get-to areas. I GOT THIS DUE TO HAVING SHOUDLER SURGERY AND IT WAS AND IS GREAT. DUE TO HAVING THIS I COULD GIVE MYSELF MY OWN BATH INSTEAD OF HAVING TO DEPEND ON MY HUSBAND TO DO IT. A LIFE SAVER FOR ME AS I'M A INDEPENDENT WOMAN. Use it to clean my back and hard to reach places.. I bought this for my 94 year old Father In Law, because he was having trouble reaching his back when showering. I thought this might help. He hasn't gotten back to me yet on how it works, so I'll update this review when I know more. Best product I've purchased for myself in a while! Works great at reaching my whole back for washing and even my lower legs. I like everything about it. Easy to use to reach my back while taking a shower or bath. Just a great brush for the back. Really like it. I love this brush, it is soft and it reaches my lower back with out any effort. I also use it to scrub my toes, as it is long enough. I have arthritis and mobility problems, and it has been a God send. I bought two as gifts. This brush is easy to use in the shower and easy to reach my whole back without straining. The bristles are stiff enough without being scratchy, yet soft enough to be soothing. After 3 weeks, I'm still happy with it. I would recomend this EZ Reach Back Bruch to mu friends. This is the first time in my life (79 years) that I have a back brush with the bristles longer than the handle! I LOVE it! This is a great brush and I would reccomend it for the young as well as the elderly. Outsstanding for people who can't reach. The ease in reaching areas that are difficult due to weak shoulder strength is very helpful and effective. This is like heaven for me. All the soft back brushes I've tried just don't make my back feel clean or refreshed. This brush is soft, yet the bristles are just strong enough to exfoliate and really clean my back. I love the length and that the shape can be curved to work just perfectly for my back. Nice length of the brush. I really appreciate being able to wash my back in the shower with this brush. The handle is nice and long to make for easy reaching and the bristles are just right. it helps in bathing better,having back pain it reaches places i can't. Great brush for your back I have dry skin and this works awesome for me. I can reach all the way down my back without straining to reach the hard spots. Takes all the dry spots off and helps with the itching to. You can either use for washing back or back scratcher. Love this item like having someone to wash you back!!! 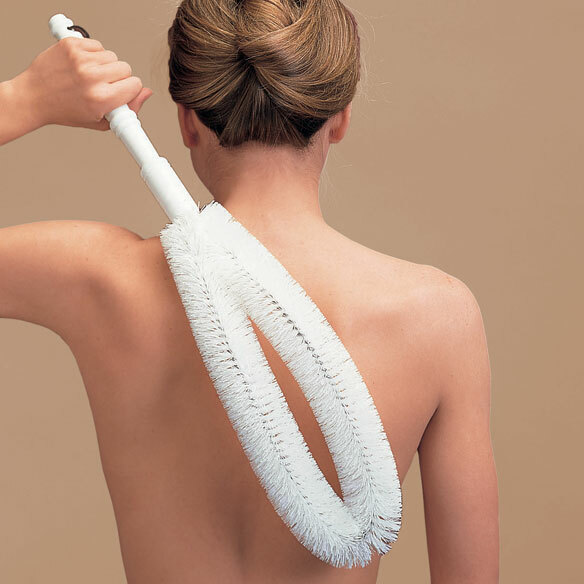 This long curved backbrush is something I've needed for a long time, since osteoarthritis restricts my ability to reach my back when showering. Glad I found it, quite by accident, in the Walter Drake catalog. I'd recommend it to anyone, handicapped or not. This brush is effective for a person with limited movement. It is soft. For me, the handle could be larger. Buy it! You'll LOVE it! Works great for scrubbing my back. Bristles not as soft as expected, but it works perfectly. Also used it to clean the shower and scrubbing the walls and bath tub. The extra length works great for scrubbing the shower too! I use this in the shower every day, no more loofas for me. I love that it is flexible enough to bend to the shape I need, but strong enough to hold that shape. Great back brush for people of all sizes. It is both effective & comfortable. Would you think all back brushes are the same? You'd be wrong! This brush is soft yet strong and its long handle can reach every part of your back. I use it on my legs , too! Apply moisturizer to your skin and you're clean and soft! Just what I needed. I dislocated my shoulder in a fall and can no longer bend my arm backwards to bathe my upper back. Now, the brush does it for me. This soft, extra long bath brush is very effective. I'm happy I took the chance on this European, spa- like product. It has a high quality feel. Love this back brush, not too soft, not too harsh, bristles are just right! Feel it thoroughly cleans my back when showering, the length and design are perfect. Being tall (6'-6") I have had to get by with back brushes, for years, that were very hard to reach all areas of my back for cleaning. The EZ Reach Back Brush works perfectly. Glad I finally found one that was made for tall people. I was looking for a bath brush and this one fitted the bill. The price was great and it is working just fine. This brush allows me to relieve my back itch caused by hives, without tearing or irritating the skin. I use it all over my body in the morning before I shower to stimulate skin cells. It's very refreshing and satisfying. I used my back brush for the first time and fell in love with it. So easy to use and it reaches and washes my whole back plus. Feels so good and I finally feel that I washed my whole back for a change. I am buying this product again. While taking a shower you are unable to scrub you back. This back brush does that for you and is so very easy to use. Both my husband and I use it daily. So far it doesn't show any wear at all. Very good quality. Great in the shower for my back. I use the Back Brush in the shower for cleansing my back. I have problems with my shoulders and this brush is perfect for reaching all of my back. this is the brush of my dreams--It BENDS!! This is a most welcome item. Long arms or short, it's going to help. I have rotator cuff problems on both sides of my body. This brush is a life saver, it allows me to reach every part of my back with ease, even the hollow part near your waist. It is invigorating and efficient. Best buy that I have made in years. It does remind you of an old fashioned toilet brush but so what, it works!! Can't go wrong with the purchase of this item. When I opened the box I laughed, kinda reminded me if a giant sized toilet brush. But this is the easiest and most effective back scrubber I've ever purchased. I'm back to buy my 3rd! Perfect. This works so much better. This is a good product and easy to use. This bath brush allows you to reach areas of your body that were out of reach before. This brush works better then any other! This is far by the best back brush I have ever owned, it is long enough to reach my back, and it feels good. Just what I needed. would buy another one. I use it every day in the shower. I THINKS ITS BETTER FOR MEN THAN WOMEN..THE BRISTLES ARE STIFF, I LIKE A STIFF BRUSH , GREAT FOR ITCHING YOUR BACK IN AREAS YOU CAN'T REACH WITH YOUR HAND. BUT SOME WOMEN MAY LIKE IT TO. IT'S EASY TO BEND TO THE CURVIATURE OF YOUR BACK OR LEAVE IT STRAIGHT LIKE IT COMES OUT OF THE PACKAGE. I'M HAPPY WITH IT. much better than my old back brush. and softer too. This brush is very long and serves it's purpose but I wish the bristles were stiffer. Great for anyone who has trouble reach an area to wash.
Back when I take showers. Rinses off easily and is ready to use the next day! This is a great back brush for the shower. A bit stiff but it is flexible enough to bend some to the shape of my back. I have had the brush for 6 months, very poor workmanship. ok but price has dropped substantially, immediatly after I bought it! This product was purchased as gift for handicapped daughter. We hope it will serve the purpose. The size is good,however, it is too soft. It should have a longer handle with a smaller stiffer brush. The bristles were to hard and stiff for my skin. I really wanted to like this, but the bristles don't hold soap and I found the feel of the bristles to be unpleasant in use. I would certainly not describe them as soft. Overall the product was not at all as described by the other reviews I read. Well, I do agree it looks like a toilet bowl cleaner and it does have a long reach.. but to what purpose if it doesn't work to clean your back. I wanted a scrub brush that feels like its scrubbing. I was looking forward to receiving this item. Very disappointed. Handle is long (that's a plus). However, the bristles do absolutely nothing. To be used as a back brush it has good size.Put a brush on the end,not the bristles the length of the handle. I wasted my money on this! the bristles were too hard, better for scratching than cleaning. Tried adding water and soap to see if got softer but didn't and have spinal stenosis so didn't want to scratch my back skin. Because my husband asked me to order one. This brush looks to be useful. Looking for this exact brush EVERYWHERE to no avail!!! Need a brush to reach middle of back to remove blackheads, etc. I just threw away a brush that was loosing its bristles and the plastic was cracking. This brush looks right for me and I hope it lasts. To help wash my back because of limited use of my shoulders. It looks like what I am seeking. I love the scratchiness of a brush on my back. I have problems with hips and lower back. My disabled husband needed a 24 inch back brush and this is the closest one to what he wanted. This being bendable may help with my self-care due to having limited motion in my shoulders. Looking forward to trying this out. I saw this brush on google--it's the perfect replacement for my old bath brush. Like the look of the product and believe it will be helpful for my sister. Bought this so I can clean my back myself. Look like it will do a great job! needed a shower back brush and this looks as good as they come. It is difficult to raise my arms above my head, so I thought this would be the perfect help for me. I like the coarseness of a brush on my back. Because I could be happy to use this on my back as I cannot reach it very well. This will help me as well as my husband.